It's so tiny that my camera can't focus on it, even on the macro setting. 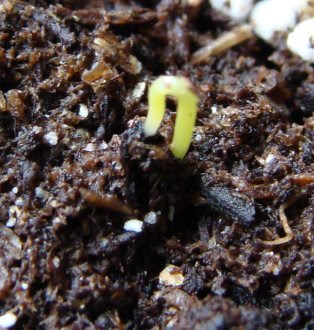 This is not the first seedling to appear in this seed tray: I proudly took a photograph of another tiny plant on Thursday, which turned out to have two cotyledon leaves. So whatever it is, it isn't a leek! I've left it there for now - there is so little green in my life at the moment that I'm even reluctant to pull up a weed. I made a rice pudding the other night, to keep out the winter cold. Doesn't it look billowingly beautiful? The first recipe I found online called for 20 ounces of rice for six people. That can't be right, can it? Instead, I went with a Delia Smith recipe, which sounded a bit more sensible (although I did increase the quantity of rice to six ounces, which worked fine). I haven't had rice pudding for so long I forgot about it until I read your post. I'll have to go find a recipe. Thanks. 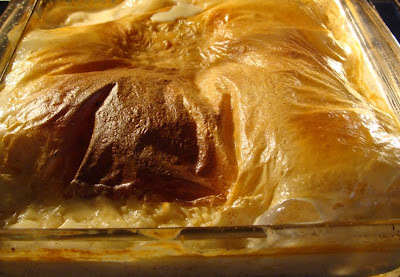 My Mum makes great rice pudding! I love my Delia Smith recipe books and still use them more than any others I have.